I am of the opinion that Bobal is a seriously underrated grape as are the resulting wines. Google it and you’re hard pushed to find more than a handful of examples for sale in the UK despite its reasonable price point and approachable character. 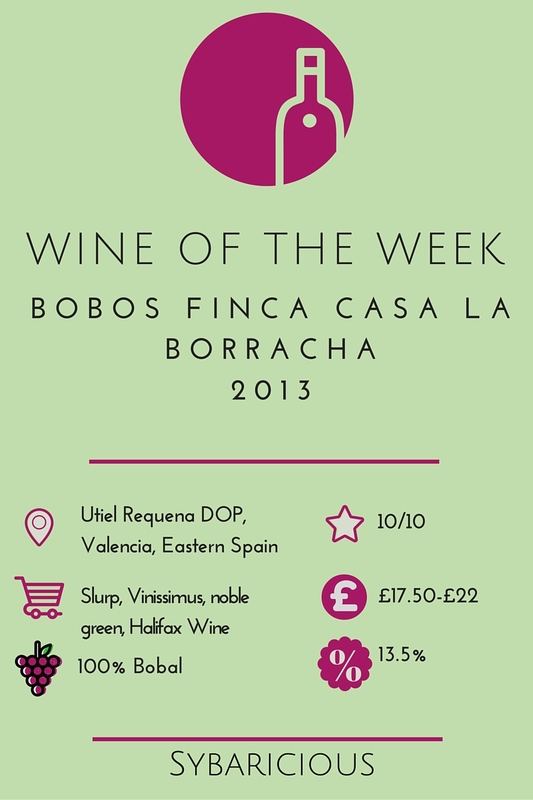 Anyway, more on the grape Bobal more generally in an upcoming Wine Grape Challenge post, for today I’m focused on one very particular Bobal that has made it to the top of the pile to be my wine of the week. 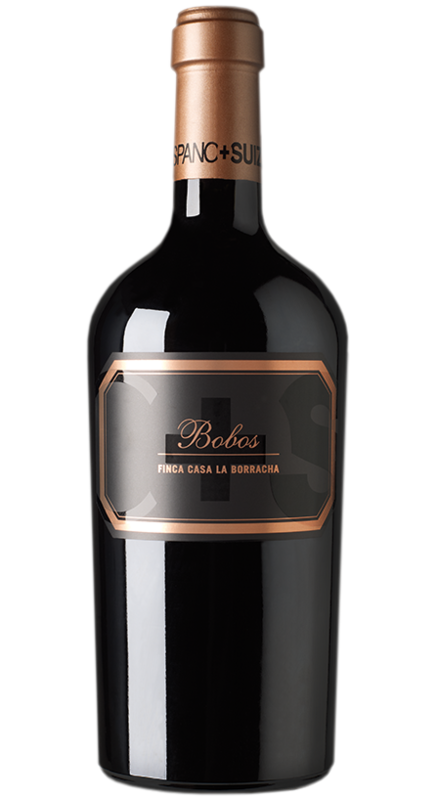 Bobos is made by Finca Casa La Borracha, a boutique winery run by three friends of mixed Spanish and Swiss nationality and located in the Utiel Requena area of the Valencia Region on the eastern coast of Spain. La Borracha make a series of wines from their 61 hectares of land all within 500 metres of the winery itself. All grapes are handpicked and fermented in 400 litre temperature controlled barrels. This is a high tech bodega with a focus on the highest quality- something that has not traditionally been the norm in the region. Slightly disappointingly the bulk of varietals grown are very international in nature; Chardonnay, Cabernet Sauvignon, Petit Verdot, Cabernet Franc, Sauvignon Blanc, Merlot, Syrah and Pinot Noir contributing to a range of 12 wines, three of which are sparkling. It is the Bobal that shines for me however and makes up 12,500 bottles of the vineyard’s annual output. So onto the wine itself. Quite an intense, rich ruby colour with a hint of purple still at the centre meets the eye. A very ripe nose of sweet spices, plump cherries and blackberries and a hint of vanilla. The palate is well balanced with the nose, reasonably full bodied without being overpowering and continues to reflect the fruits of the nose. Some secondary character is displayed courtesy of the use of both American and French oak barrels and a 10 month maturation in new oak barrels but not too keenly. Slight tertiary notes are creeping in with a hint of leather but most evidently through a savoury undertone that many have described as like a good balsamic. It might be a 2013 wine but it tastes way more developed than its three tender years. I would expect it to drink well for at least another 3 years but fully expect that my case will not last that long. Although tannins are still present (as you would want them to be) they have mellowed into something silky soft like a cuddle for your mouth. At 13.5% alcohol it is not as boozy as many reds coming out of Spain and so is not overpowering but still radiates warmth and ripe fruits redolent of a Spanish summer. I bought a bottle from Slurp wines here for £19.95. Halifax Wines have it here for the same price. Granted it’s not the cheapest wine in the world but I promise that it’s worth it! So worth it that a full case soon followed into my cellar. The vineyard itself (rather unusually especially for Spain) sells wine direct to the public over the internet at 20 Euros a bottle so the UK Slurp & Halifax Wine prices are very competitive indeed.